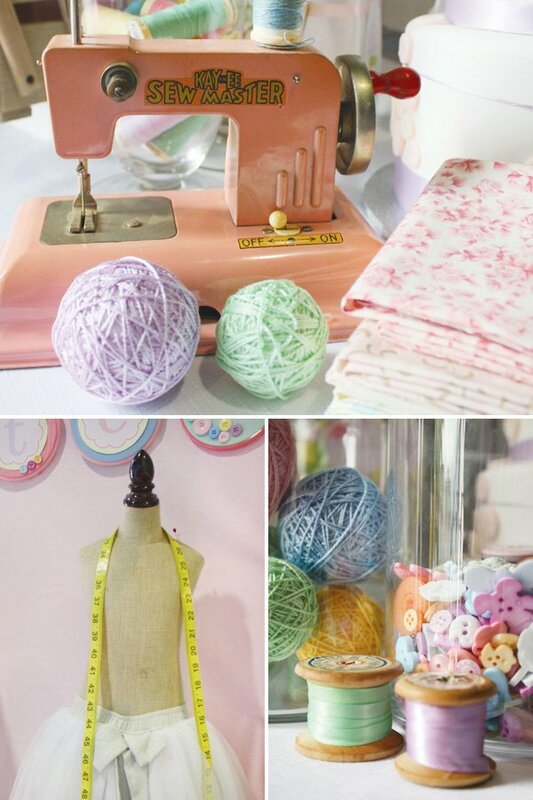 If you’re looking for a new spin on the ever-popular Cute as A Button theme, Kiss Me Kate “sew” has you covered with her adorable vintage sewing party inspired Cute as A Button First Birthday! 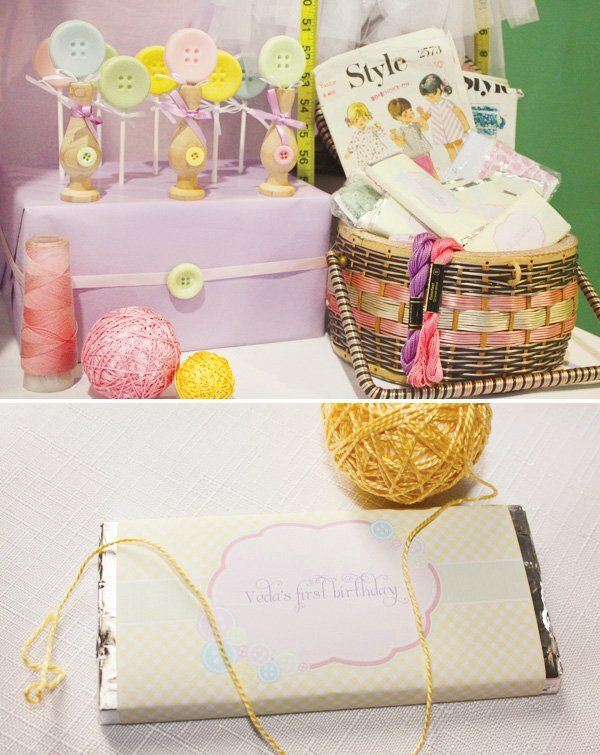 Taking a cue from the soft pastel color palette and retro elements like an antique KAY-EE doll’s sewing machine, Anders Ruff designed an adorable collection of gingham check printables to match all of the sweet decor. P.S. 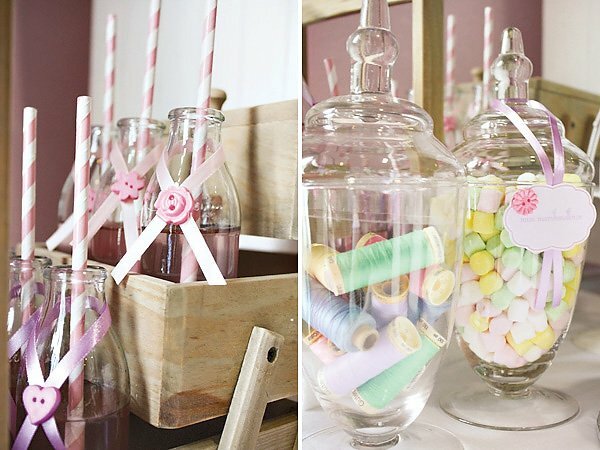 This is great inspiration for a Cute As a Button baby shower too! 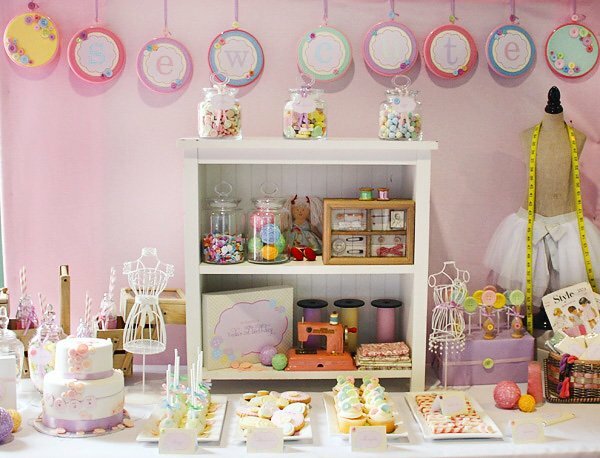 We were approached by our client to style a dessert table in celebration of her daughter’s first birthday. We were so excited when we were told that the theme for the party would be ‘As cute as a button’. This is such a gorgeous theme to style and the possibilities endless. 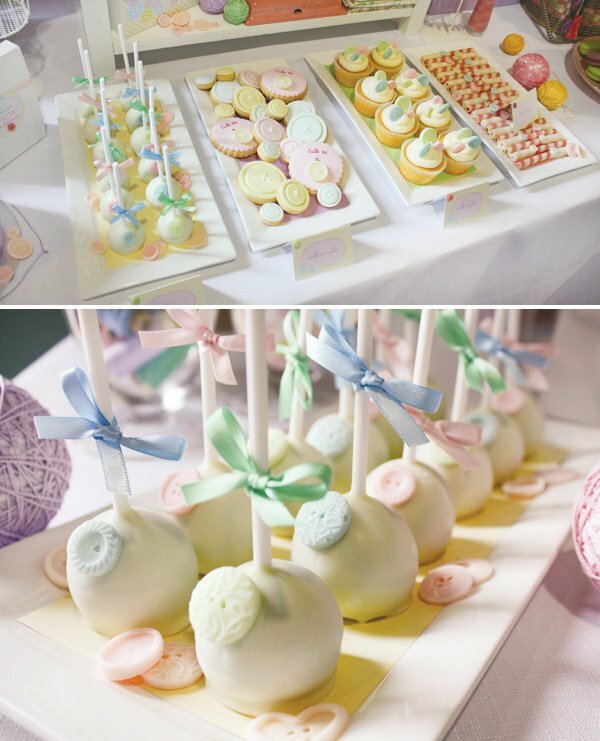 Our client requested a colour palette of soft pastels and wanted the desserts to be themed with buttons. 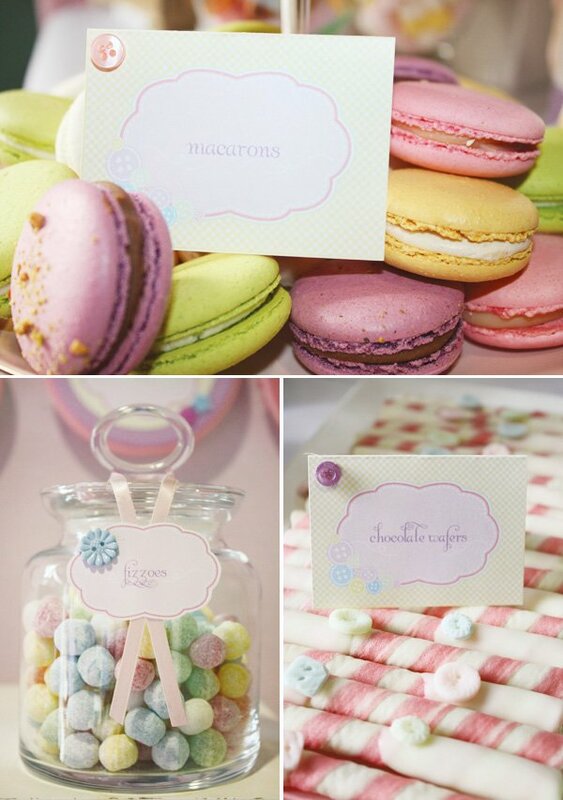 We embellished almost every dessert with pastel buttons and styled the table with vintage sewing accessories. Some of the props included a child’s sewing machine, vintage sewing basket and a designers body form draped with a measuring tape. The two tiered ombre birthday cake was decorated with an assortment of pastel buttons and personalised with the child’s name. 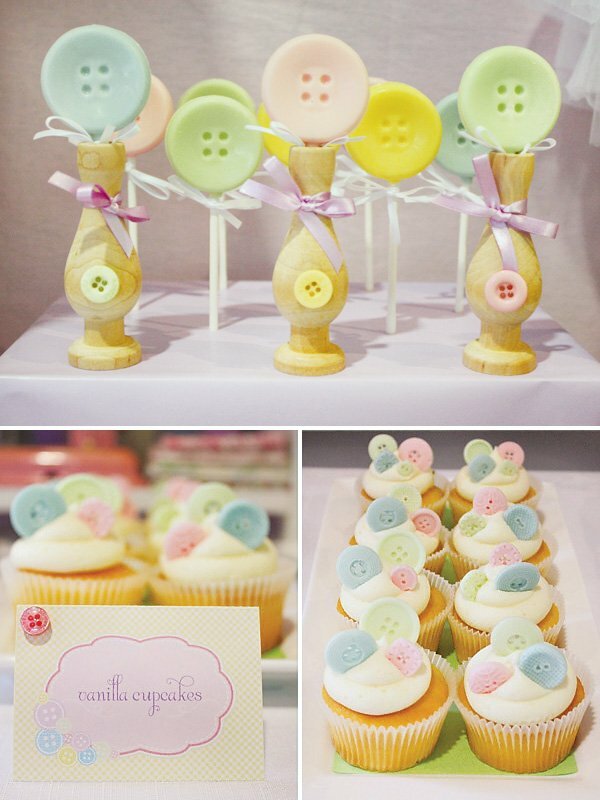 The cake pops, wafer sticks and cupcakes were also adorned with pretty pastel buttons. The backdrop featured a banner of hoops embellished with … you guessed it, more buttons and it read “Sew Cute” All the guests were given a take home favor bag containing a “Cute as a button” photo frame. We sourced most of our props from fabulous second hand Op shops we have here in Melbourne and found all the beautiful vintage props including the adorable 1950’s KAY-EE doll’s sewing machine, still in perfect working order and old wooden sewing spools. Oh so cute!! Love this theme and the colors! What an adorable theme – I haven’t seen this done before and love it! The button theme is super cute! I’ve seen this theme before but never as cute as this one! I adore Kiss Me Kate and everything that they do. They did such a killer job on the styling and desserts! yay! LOVE my girls at Kiss me kate! Oh my, oh my those fondant buttons are too cute! Great theme and the cupcakes are the best. Thanks to Yolanda and Kate for beautiful birthday presentation for my daughter's first.You guys are the best. 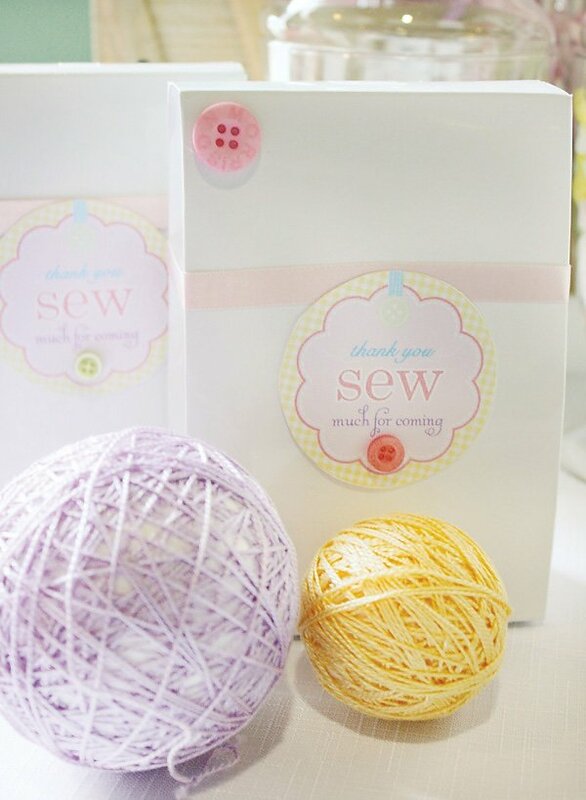 As a sewing enthusiast, this party captured my attention, and heart, at first glance! Does anyone know what the Hostess Cup Cake was called in 1961? Was it just "Cup Cakes"? this theme is so cute! make me wish I had another baby girl to give a first birthday party to, cause I am so in love with this! The suckers that are on the purple platform, are they in wooden vases? This theme is so adorable. Would be cute for a baby shower.